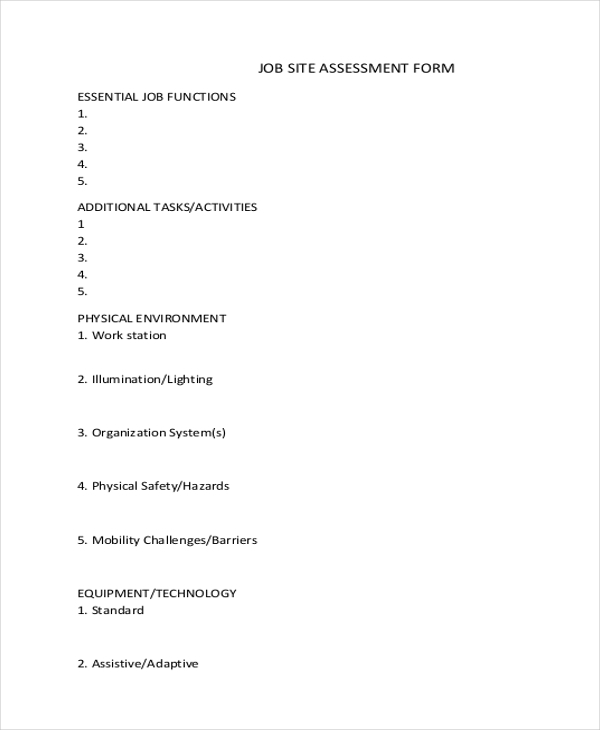 A job safety assessment form is usually used to check and remark many different specifics and activities which are or were carried out during a particular task or activity. Also, the safety measures and procedures are marked and commented on. 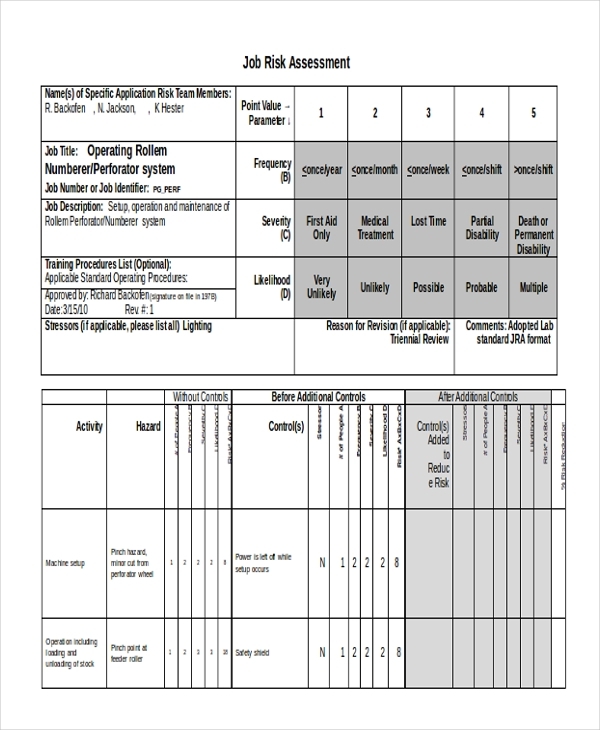 A job risk assessment form is utilized to rate the different functions or activities performed during the process of a particular undertaking. The crux of a form of this type is to check and highlight any risk factors which may be involved or associated with a particular endeavor. A more simplified version of a job safety analysis is also widely used. The content in the form is very straightforward. Company details and work description is followed by a three-column table which includes – Job Steps, Hazards and Barriers of Control followed by approval fields which are blank and need to be filled. 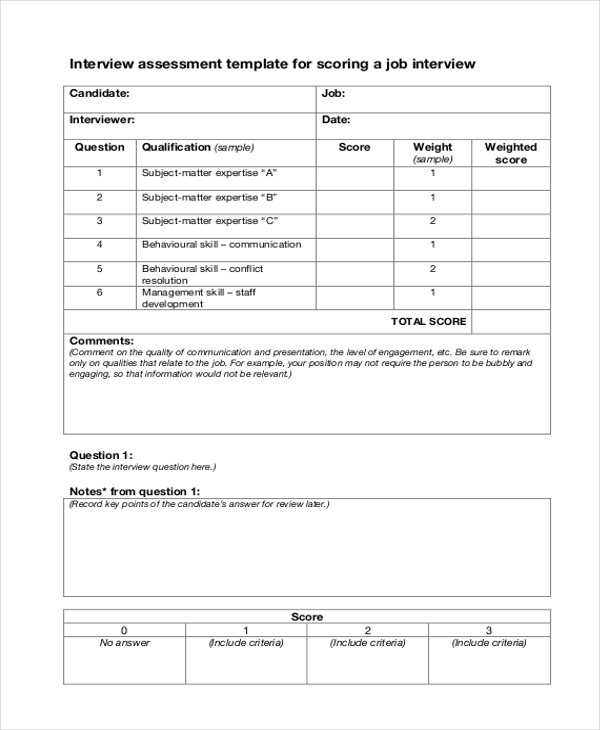 A candidate assessment form is used to rate or rank the various competencies of an employee. Such a form may be exclusively used for examining the performance of senior managerial employees. 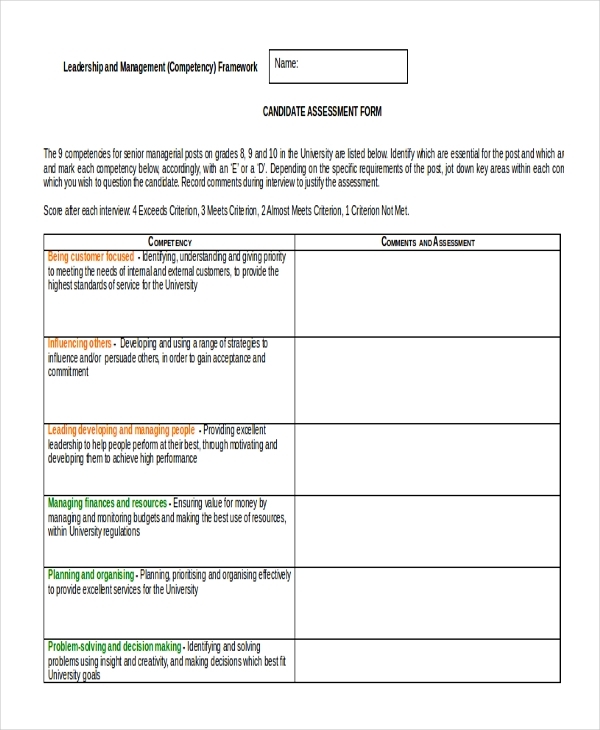 Competencies are specified in the first column followed by Comments and Assessment, Score columns which need to be populated with relevant commentary. After the completion of a candidate’s interview round, interviewers assess the various aspects of the candidate. This task is accomplished on a job interview assessment form which contains multiple areas which need to be scored and weighed accordingly. Job Employee assessment form is used to examine and analyze the performance of an employee on various grounds. A text box containing multiple blank fields needs to be filled with relevant information about the employee in questions. 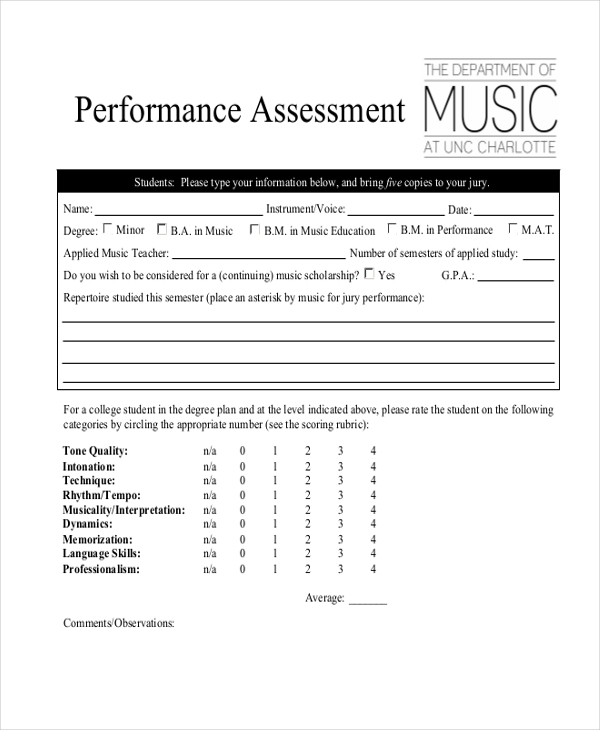 The later half of the form is used for marking/scoring the various parameters of performance. In many technical industries, a job hazard form is often used to scrutinize the nature of severity of job hazards which are or may be involved in a particular technical or non-technical procedure. Based on the descriptions and assessments made, plan of action statements need to be spelled out and followed accordingly. 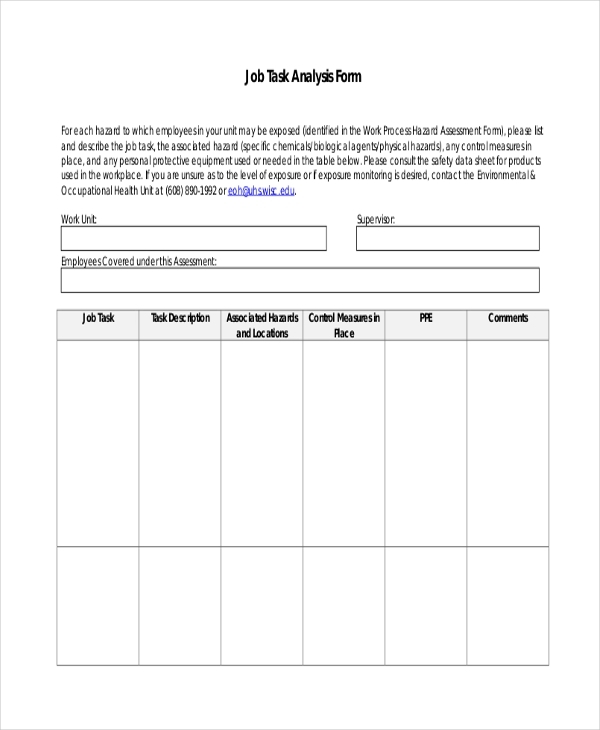 A job site assessment form is useful for remarking on the various aspects seen or noticed at a particular job location. Job functions, Additional tasks Physical Environment, Equipment/Technology, Location Demands and Summary needs to be populated with required details. 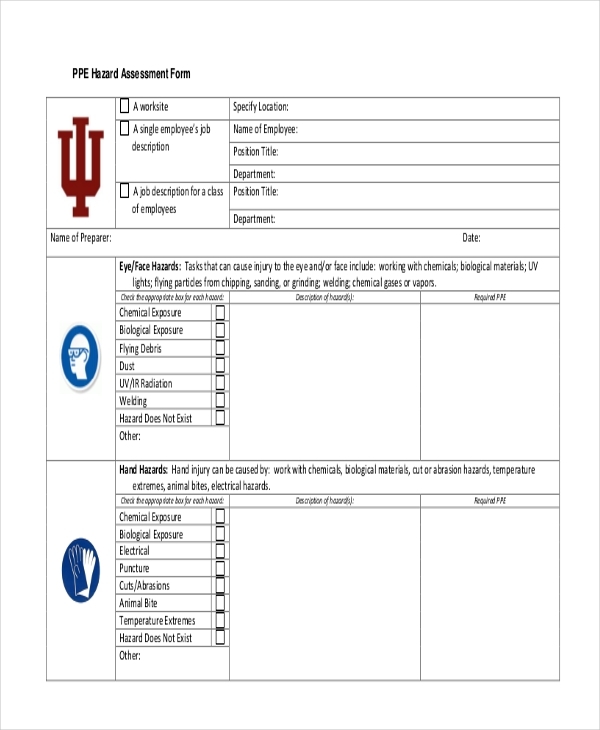 The principle use of job assessment forms is to give an insight into a particular job, hazard, interview process, and employee performance. The scoring or marking of various different fields or parameters indicates how good or bad the subject of assessment is and also unveils the areas which need improvement. Companies and professionals are known to use and take assessment forms seriously and rightly so! Be it for an interview process, candidate performance screening, employee job assessment, task performance assessment, assessment forms are mighty important and useful in all regards and respects. They provide more than just guidance and clarity. They lend and improvise perspective.